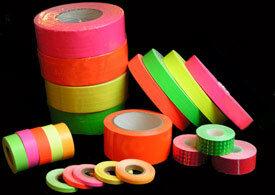 FLUORESCENT COLORED TAPES - These UV fluorescent (also known as "Neon") colored tapes, are vivid, attention getting colors. They are available in a variety of materials, some of which fluoresce (glow) brightly under "black light" (ultra-violet light) in a dark room. Fluorescent tapes are listed below in order of relative reactivity to black light (UV light), brightest listed first. CAUTION: Never look or stare directly at a UV or black light! Sylvania 15-watt "BLB" (club and forensics) rated black-light bulb.